In recent years, though, I’ve begun to let go of past prejudices. With the right prep work and with plenty of guidance, student presentations can be educational, if not top notch, and they can be a wonderful end-of-semester exercise. So, on to class projects, I thought. Eastern Nazarene College is right next to the Josiah Quincy House (built in 1770). It’s a beautiful colonial home and a national treasure sitting right in our backyard. But none of the students in my class even knew where it was located. So for my course on historiography, methods, and the practice of history I decided to have the students help me build a resource website for this storied home. The result was pleasantly surprising. The students were interested in the project, if not wildly enthusiastic about it. We started with an early-March guided tour of the house. Eyes lit up when our guide Leah Walczak spoke of prominent visitors to the home: Benjamin Franklin, the Marquis de Lafayette, and, of course, John and John Quincy Adams. (The Quincys and the Adamses had a little rivalry going on, which added a dash of drama to the project.) The students invested considerable time in tracking down sources and finding out about this amazing colonial home and its remarkable history over the ages. We tried to make the site a useful little guide for anyone who might be interested in the mansion and the illustrious Quincy family. So, along with some general information about the house and the Quincys, we've included architectural information; an extensive bibliographical page (the students went to town on this! 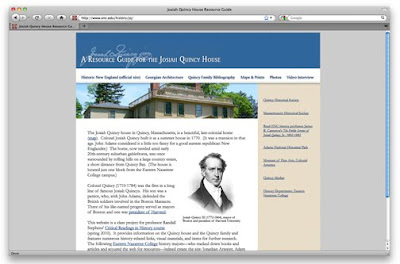 ); a JQ family line; hi res photos of the house; numerous maps, prints, and paintings; a video interview with Leah Walczak (chief curator); and a variety of links dedicated to local and regional history. We have also included links to as many full-text books, articles, and manuscripts related to the family and the mansion that we could find. I was impressed with student initiative. They were tracking down items and working on leads that had escaped me. But, in the end, what do students take away from such a project? What use is it? Well, they certainly seemed to hone their research skills. They also have thought about how best to present history to a broader public. We discussed the layout of the website, the order and title of subpages, and more. I have hoped students come away from a class like this with renewed curiosity. I have also hoped they will think more about how history connects to the world around them. Among other things, their work on the Josiah Quincy site, it seems to me, linked past to the present quite effectively. This is really encouraging. We very much need something like this at Southern--the students need to see how their knowledge has real implications and that the skills they've developed are useful, even if they don't go to graduate school. Thanks for sharing--and for being brave enough to do this. Do you think you'll do something simliar in the future or was this a one-off and now that the project is done, it will be hard to find such projects down the line? Yeah, I want to do a similar project next time I teach the course in 2 years. Will be easier next time around, now that we have a template.